The 2018 Mitten Award Work Group scrutinized more than 250 picture books to select this year's winning title and honor books. "I am very proud of the work, thoughtfulness, and collaboration that this year's group put into the reviewing and selection process," said Mitten Work Group Chair Audra Eddy. Collectively, Mitten Work Group members devoted nearly 500 hours to reading and evaluating picture books to select the titles that best combined and mostly successfully displayed the criteria deemed most important to the picture book format. The work group read throughout the year to narrow selections to the Top Ten Titles and determine the winning title and honor books. At the 2018 Spring Institute Conference, the Mitten Top Ten Titles were announced. The winning title and honor books were announced at the 2018 MLA Annual Conference. 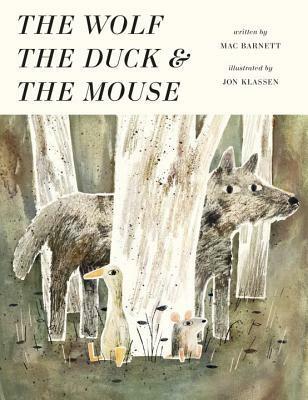 The Michigan Library Association (MLA) is pleased to announce The Wolf, the Duck & the Mouse by Mac Barnett and illustrated by Jon Klassen, published 2017 by Candlewick Press, is the winner of the 2018 MLA Mitten Award. One morning, mouse gets gobbled up by a hungry wolf. Inside the wolf’s stomach, mouse meets duck who has figured out how to make the very best of his situation. “I may have been swallowed, but I have no intention of being eaten.” Mouse, too, discovers that living inside wolf’s stomach has its benefits. All is well for the two swallowed ones (not so much for wolf who gets a belly ache), until a hunter comes along and aims for the wolf. Lives are saved, the hunter flees, and – as in a pourquoi tale – we learn why the wolf still howls to this day. Jon Klassen is a Canadian-born author and illustrator. He has written and illustrated three picture books of his own and illustrated many other author's texts. His own books are called I Want My Hat Back, This Is Not My Hat and We Found A Hat. Highlights of his illustrated books are Sam & Dave Dig A Hole by Mac Barnett, The Dark by Lemony Snicket, and his latest is The Wolf, The Duck & The Mouse also by Mac Barnett. His books have won a Caldecott medal and two Caldecott honors and other international awards. He lives in Los Angeles, California with his wife and son. The Mitten Award, established in 1999, is designed to recognize and promote quality literature for youth in picture book format, and the ability to communicate to that audience through literature. The award selection work group is comprised of Michigan librarians who consider hundreds of children’s books annually to determine a winner.